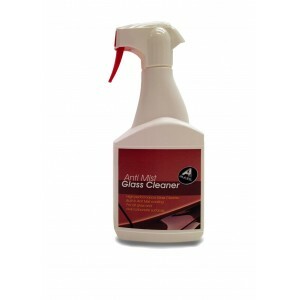 AGlaze Anti-Mist Glass Cleaner is designed to clean interior glass and mirrors, leaving an anti-mist coating on the glass which helps prevent the glass from misting up. The anti mist effect will remain constant as long as the glass is only cleaned with the Anti-Mist Glass Cleaner. Using a standard glass cleaner will remove the anti mist properties. Do not apply with microfibre cloth. For best results use our white multi purpose polishing cloths to apply.